The Jeanette Rankin Scholarship Fund provides $2,000 scholarships to women over age 35 with low-incomes to return to school. JRF has distributed more than 750 scholarship since its’ founding in 1976. Now, they have made the scholarship application available online and have experienced a surge in responses, but lack the number of volunteers needed to assess the applications. We are creating an interactive, modular volunteer training program that can be used anywhere at anytime. This will increase the number of people who become volunteers since it will be available for potential philanthropists nationwide. We are using iBooks Author to produce an iBook that will incorporate all of the information volunteers need to know to perform their jobs, but in a more exciting and interactive way. We are implementing responsive web graphics and short video clips intermixed among the typed information. 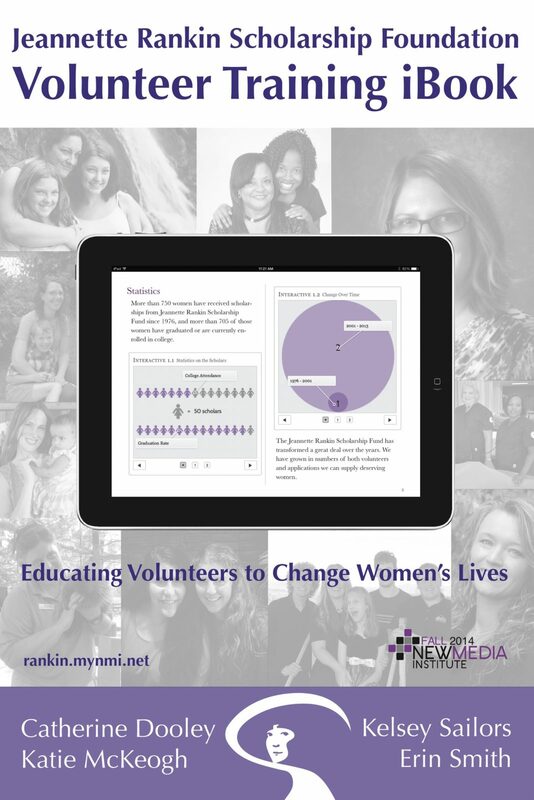 The impact our iBook will have will be nationwide as JRF will be able to analyze more applications and more women will receive these awards.